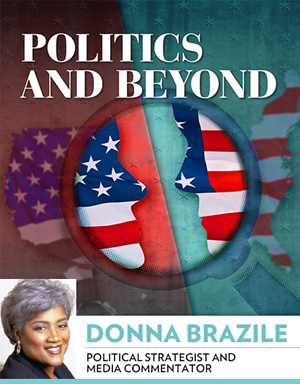 Political strategist and commentator Donna Brazile will discuss "Politics and Beyond" at the next Maverick Speakers Series event. The lecture is at 7:30 p.m. Thursday, Feb. 25, at Texas Hall. A question-and-answer session will follow. 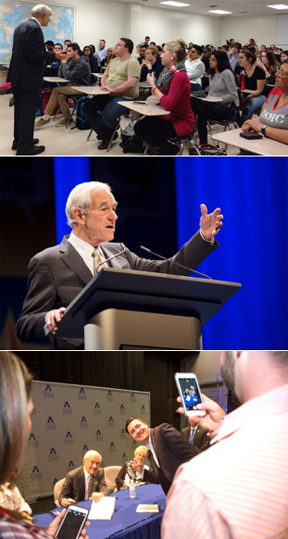 Former Congressman Ron Paul shared his thoughts about freedom, politics, and the future last Tuesday at UTA. After meeting with a master class in political science, Dr. Paul enjoyed dinner with alumni and VIPs. He spoke to a packed house at Texas Hall for the Maverick Speakers Series, then signed copies of his book Swords Into Plowshares and posed for a few selfies. See more photos and watch the video. UTA Parking and Transportation Services begins management of the Maverick Parking Garage on Friday, Feb. 19. The Maverick Parking Garage—located between Hammond Hall and Pickard Hall—will remain a separate entity. Garage permits are not valid at UTA parking lots, and UTA parking permits are not valid in the garage. To renew a garage reserved space permit, go to the parking office in the Wetsel Service Center. Renew general permits online. Night passes will not be available. The parking rate is $3 per hour. Preferred parking permits are $449 per semester. Reserved space permits are $599 per semester. A new digital parking meter will be on the first floor for hourly use. Go online for questions about the Maverick Parking Garage and to read the garage rules and regulations. For more information, contact Parking and Transportation Services at parking@uta.edu or 817-272-3907. Applications for the Terry Foundation Scholarship program, the largest private source of scholarships in the state, are due today, Tuesday, Feb. 9. 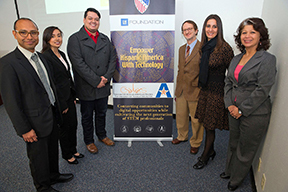 The new technology lab in the Center for Mexican American Studies officially opened thanks to support by the League of United Latin American Citizens (LULAC) and representatives of the General Motors Arlington assembly plant. Part of LULAC’s Empower Hispanic America with Technology initiative, the lab is to assist students with college applications and information about STEM programs. Visit uta.edu/sc or call 817-272-0556 for more information. Join the Dial-a-Mav team for the Office of Development and Alumni Relations. Candidates should be comfortable making phone calls and have a clear speaking voice. Apply for SnapJob 8725 and complete a second application. 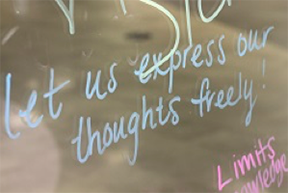 The foyer glass walls in the Central Library are available to student organizations and University departments.The walls may be reserved for up to seven days, but only once per semester per organization or department. See the Foyer Glass Walls Request Form. For questions, email Kiriakis Newman at kiriakis@uta.edu. A GMAT verbal course starts Wednesday, Feb. 10. Men's Basketball on ESPN3 Watch the Mavericks vs. Texas State on ESPN3. Tip-off at 8 p.m. Viewing party at Grease Monkey Burgers, 200 N. Mesquite St., Arlington. Athletics. 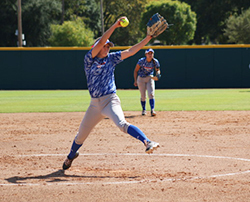 Softball: UTA Invitational Mavericks vs. Texas Southern. Tickets $5-7 general public, $3 students. 6 p.m., Allan Saxe Field. Also, vs. Northern Colorado, 4:30 p.m., and vs. Detroit, 6:30 p.m. Friday, Feb. 12; vs. Texas Southern, 2 p.m., and vs. Missouri State, 6:30 p.m. Saturday, Feb. 13; vs. Detroit, 10 a.m. Sunday, Feb. 14. Athletics. Tennis Lady Mavs vs. Nevada-Reno, 11 a.m.; Mavericks vs. Missouri-Kansas City, 1 p.m. Free. UTA Tennis Center. Athletics. Basketball Doubleheader Mavericks vs. Appalachian State. Tickets $7-20 general public, $3 students. Maverick women's game 5 p.m., men's game 7:15 p.m., College Park Center. Also, vs. Louisiana-Lafayette, women 11:30 a.m., men 7:15 p.m. Thursday, Feb. 18; and vs. Louisiana-Monroe, women 5 p.m., men 7:15 p.m. Saturday, Feb. 20. Athletics. UTA Jazz Festival The UTA Jazz Ensemble performs with guest artist Denis DiBlasio. Tickets $9 general public, $6 students, seniors. 2 p.m., Bluebonnet Ballroom, E.H. Hereford University Center. Also, 8 p.m. Saturday, Feb. 20. Music. K-12 Focused Technology Series Explore online learning in K-12 and higher education. Twitter chats, hashtags, and social media as learning, noon-1 p.m., Room 111, Trimble Hall. Also, speaker Kayla Parker of Coppell ISD, Feb. 16; mobile learning and microlearning, Feb. 24; Harrison McCoy, connecting globally with technology, March 1; Makerspaces and UTA FabLab, March 8; and Jim Holland, Google Classroom, Canvas, and anything related to LMS/CMS, March 22 and 29. Education. Critical Issues in the Black Community: Pursuing Justice for All The fourth annual Center for African American Studies conference profiles progressive solutions to social problems. Speakers include Valeisha Butterfield-Jones, CEO of Women in Empowerment Entertainment Network; Shaun King, social justice writer for New York Daily News; film director Arthur Muhammad; and actor Aundre Dean. Register online. 6 p.m., E.H. Hereford University Center. Also, Saturday, Feb. 13. Center for African American Studies. Film Screening: 'The Big Picture: Rethinking Dyslexia' Join in a discussion after the film. Free. 2-3 p.m., Room 100, Nedderman Hall. Education. Focus on Faculty Krystal Beamon, associate professor of sociology and anthropology. Noon-1:30 p.m., sixth floor parlor, Central Library. UTA Libraries. Maverick Major Fair Enjoy a fun atmosphere for learning about degree options and how to declare a major or minor. Enter a drawing for a Maverick Prize Pack. 11 a.m.-1 p.m. Wednesday, Feb. 24, Concho Room, E.H. Hereford University Center. University Advising Center. High mark: Senior Roland Sales, top and left, and freshman Alexus Henry, right, set new UTA high jump records at the Charlie Thomas Invitational on Saturday in College Station. Drew Charles, bottom, and fellow Mavs hit the courts at Texas State for tonight's competition, which is televised on ESPN3. Senior Roland Sales smashed the school record and posted a top-5 national mark while winning the men's high jump title at the Charlie Thomas Invitational on Saturday at College Station. Sales cleared 7 feet, 2 1/2 inches, to topple the previous mark. His mark is tied for the fourth best in the nation this year. On Friday, as part of the pentathlon, freshman Alexus Henry broke the women's mark by clearing 5 feet, 10 inches. 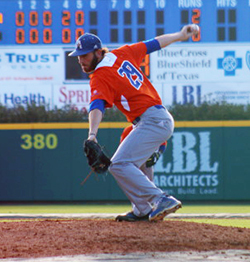 UTA heads to Wichita, Kan., for the Herm Wilson Invitational on Friday-Saturday, Feb. 12-13. The Sun Belt Conference Indoor Track and Field Championships is Monday-Tuesday, Feb. 22-23 in Birmingham, Ala.
Watch the Maverick men’s basketball team take on Texas State on ESPN3 starting at 8 p.m. tonight, Tuesday, Feb. 9. The Mavericks are 15-7 overall and 6-5 in league play after a 90-69 victory over Georgia State on Saturday. Three home games start with Appalachian State on Saturday, Feb. 13, follow by Louisiana-Lafayette on Thursday, Feb. 18, and Louisiana-Monroe on Saturday, Feb. 20. All games are at 7:15 p.m. in College Park Center. The Lady Mavericks basketball team face Texas State at 1 p.m. today, Tuesday, Feb. 9, in San Marcos. The team is 10-11 overall and 5-6 in the Sun Belt after winning three of four road games. 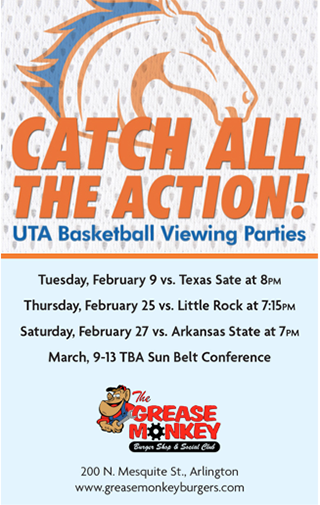 UTA hosts Appalachian State at 5 p.m. Saturday, Feb. 13, at College Park Center. Other home games include Louisiana-Lafayette at 11:30 p.m. Thursday, Feb. 18, and Louisiana-Monroe at 5 p.m. Saturday, Feb. 20. The Maverick men's tennis team Mavericks improved to 5-3 by sweeping Cameron and Seminole in a doubleheader Saturday and A&M-Corpus Christi on Monday. The team plays Missouri-Kansas City on Friday, Feb. 19, at the UTA Tennis Center followed by a three-game road trip. The women’s tennis team won 7-0 win over Montana State in its spring season opener Friday at the UTA Tennis Center. The Mavs play at home against Nevada-Reno at 11 a.m. Friday, Feb. 13; Missouri State at 2 p.m. Friday, Feb. 19; and Sam Houston at 10 a.m. Sunday, Feb. 21. Upcoming intramural sports deadlines are rock climbing, today, Tuesday, Feb. 9; racquetball, Friday, Feb. 12; indoor soccer, Wednesday, Feb. 17; tennis, Friday, Feb. 19; softball, Wednesday, Feb. 24.